On the evening of April 5, 2009, Michael Hickenbottom and Mark Calaway didn’t put on just another excellent performance. They produced a classic match that a generation of wrestling enthusiasts look to as the capstone of their fandom. I knew Undertaker vs. Shawn Michaels at WrestleMania 25 was going to be something special considering the landscape of WWE at the time. Taker and Michaels were already legendary performers who had the backstage clout to do whatever they wanted from a creative perspective. With both men being 44 years old at the time, however, some felt this match could never live up to their classic bouts with each other, twelve years earlier. Oh, the wonders of ring psychology. Their feud couldn’t have been simpler. Undertaker’s undefeated streak was the holy grail of accomplishment, and Michaels wanted his name etched in history as its conqueror. Michaels had to qualify for the opportunity by beating Vladimir Kozlov who also yearned for a shot at ending the streak. Michaels was perturbed someone of his stature had to qualify for anything. He bragged about his own streak of never being pinned by The Deadman. This is true regarding televised bouts, which is all that matters in storytelling. In reality, Taker had pinned Michaels several times at house shows in late 97 through early 98. 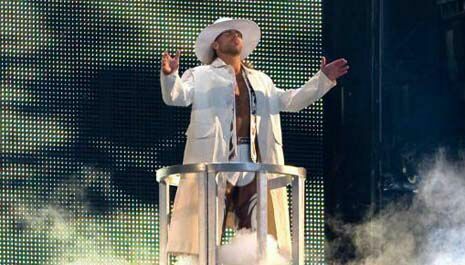 Inspired by his religious faith, Michaels called himself the light that would eclipse the darkness embodied by “The Phenom.” To drive the point home, he even wore a white hat and trench coat in contrast to Undertaker’s distinguished black ensemble. Sixty one thousand people inside Reliant Stadium were on the edge of their seat for the in-ring poetry exhibited by these two titans of the industry. However, that is not how it started. The first eight minutes of the match was slow and garnered next to no reaction from the crowd. A forgotten fact due to the bout’s high esteem. I was watching WrestleMania at a friend’s house that year. Early on, no one in Brian Applegate’s living room was impressed with the match. My training as a wrestler, however, taught me that the best wrestling matches start slow and then builds to a crescendo followed by an epic climax. Things began to pick up as both men exchanged a series of big moves followed by a dramatic escape where Michaels survived the Undertaker’s gogoplata submission. Michaels missed a top rope moonsault to the floor, which was shocking enough to witness, nevermind what followed. Undertaker went for his signature dive over the top rope, but Michaels moved out of the way. Undertaker crashed into the cameraman, who was Sim Snuka (Jimmy Snuka’s son) working as a plant designated to catch him. Snuka missed timed the catch and Undertaker landed straight down on his head. Luckily, Undertaker miraculously avoided injury by tucking his head at the last possible second. The tempo of the match heated up even more as both men kicked out of each other’s big moves. This type of work was surprising to see in a WWE setting as their timing and execution was on an entirely new level. The closing moments of the match saw Michaels come off the top room with a moonsault, only for Undertaker to catch him in mid-air and drilled Michaels with a tombstone piledriver for the 1-2-3. The adulation in Brian’s living room was at a fever pitch. None of us could believe what we had just witnessed. I looked at my phone and saw a Facebook post by WWE superstar Mike Kanellis, who was working for Ring of Honor at the time. He stated, “That match reminded me of why I love professional wrestling.” It’s a sentiment that thousands of wrestlers and fans echoed on social media as we all reveled in a state of grappling euphoria. A wrestling match is not about doing big flashy moves. It’s about doing the right moves at the right time to tell a story. Shawn Michaels was the biggest threat to the Undertaker’s undefeated streak. The drama of it all was augmented by every well-chosen and well-timed move, sell and facial reaction. Everything they did in the ring meant something. This outing transformed the streak from famous to infamous because we genuinely didn’t know who was going to win.